Would be very interesting to know how many miles he has walked in his lifetime – 2 maybe?????!!!!!! 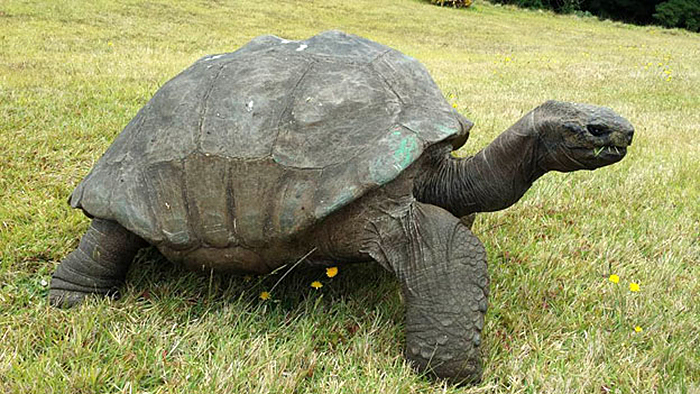 On St.Helena, the tropical island in the South Atlantic Ocean there are five giant tortoises, one of them is Jonathan. Jonathan (hatched c. 1832) is a Seychelles giant tortoise that lives on the island of Saint Helena, a British Overseas Territory in the South Atlantic Ocean. Even though, virtually blind from cataracts and has no sense of smell, Jonathan as 182-years-old, may be the oldest land creature currently living on the planet. 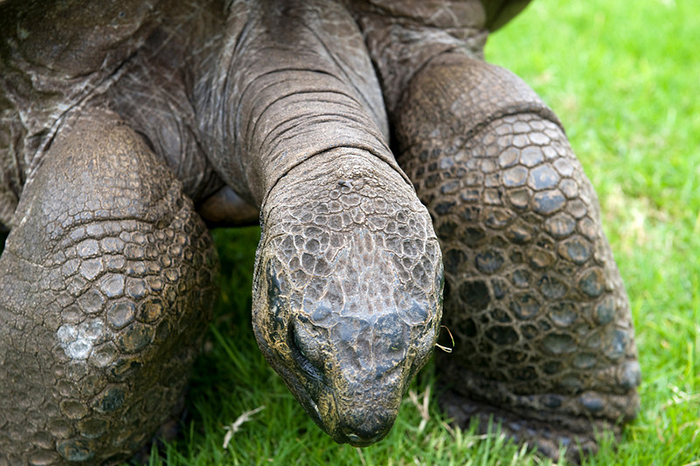 Jonathan was brought to the island from the Seychelles in 1882, along with three other tortoises at about 50 years of age. He was named in the 1930s by Governor Sir Spencer Davis. He continues to live in the grounds of Plantation House, the official residence of the Governor, and belongs to the government of Saint Helena. His possible age was realised when a photograph was uncovered from a collection of Boer War images showing a tortoise next to a war prisoner around the year 1900. On 5 December 2008 the Daily Mail published a story claiming Jonathan is the same tortoise pictured in the photograph. If he were about 70 years old at the time of the photo, he could now be the oldest known living reptile on earth. The article erroneously stated Jonathan was of the species Testudinipae cytodira. This appears to be a double misspelling as well as a reference not to his species, but rather to his family, Testudinidae and suborder, Cryptodira respectively. Jonathan maybe the oldest land animal currently living, but other tortoises have lived longer. 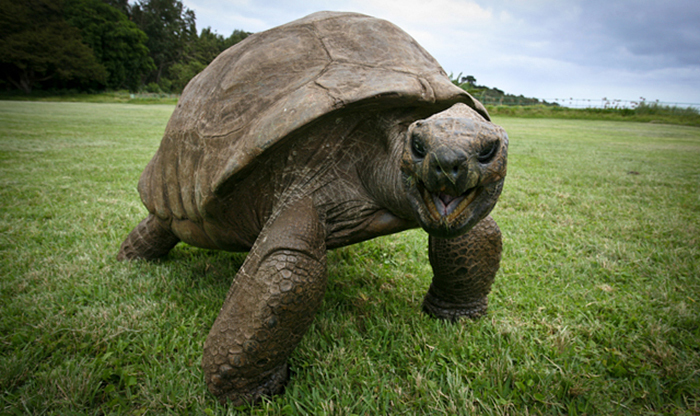 The all-time verified record holder for the world’s oldest tortoise, according to Guinness World Records, is Tui Malila, who died in Tonga in 1965 at the age of 189. Adwaita, an Aldabra giant tortoise that died in 2006 in the Alipore Zoological Gardens of Kolkata, India, is believed to have lived to the age of 255 years but this has not been confirmed. 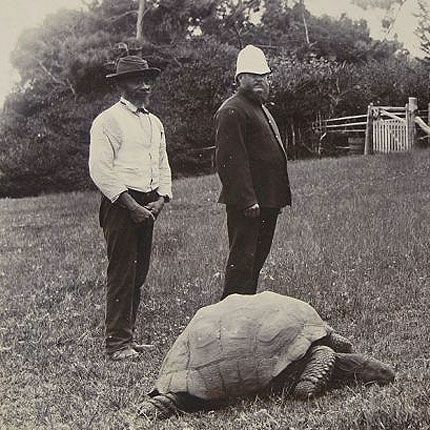 Harriet a Galápagos tortoise who had an estimated age of 175 years at the time of her death in Australia in 2016, was reportedly collected by Charles Darwin during his 1835 visit to the Galápagos Islands as part of his round-the-world survey expedition. In February 2014, as part of the Queen’s Baton Relay ahead of the 2014 Commonwealth Games, the baton visited Saint Helena and Governor Mark Capes, whilst holding the baton, posed for a photo alongside Jonathan in the grounds of Plantation House. BBC Radio featured Jonathan in an episode of From Our Own Correspondent in March 2014 after ocean rower Sally Kettle visited Saint Helena.The Saint Helena five pence coin has Jonathan on its reverse. As at December 2015 Jonathan was reported to be “alive and well”. “He’s blind from cataracts, has lost his sense of smell, and so cannot detect food (his fellow giants mug me and can detect the tiniest morsel dropped on the ground), but he has retained excellent hearing.